Summer is at peak and every brand is welcoming this season by introducing their new collection. It’s time to fill your wardrobe with exceptional and stylish clothes. All the major brands have offered a reasonable sale on all outfits. Some major such as Alkaram, Breeze, Junaid Jamshed (J.) and Warda. All these brands are providing a reasonable amount of discount on all wearables. Summer sale 2018 is ready to fill your wardrobe with class, style, and fashion. Alkaram is the biggest and famous Pakistani clothing brand working since 1986. They have offered a significant amount of discount on summer Sale 2018. The sale is available on all men, women, kid’s accessories. 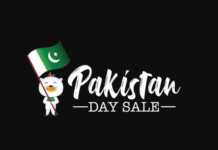 The sale includes PRET, unstitched, 2-piece Lawn suit, 3-piece Lawn suit and much more. Alkaram decided to make this summer more memorable by offering following reasonable discounts on different accessories. When we are talking about the famous brand, how can we forget J. whose name is dedicated to the Late Religious Scholar Junaid Jamshed Sir? Like every year, this year J. brings excited summer sale 2018 with a reasonable amount of discount. 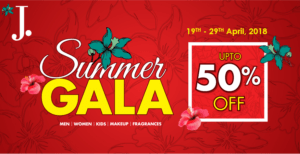 On the eve of this new season, J. have introduced Summer gala and gives 50% flat on men clothing, women clothing, fragrances, and makeups. The offer is valid from 19th April to 20th April 2018. This summer, your wardrobe needs something unique and comfortable wearable clothing. Don’t worry, Warda will do this for you by providing latest branded products on special discount. A bundle of wearable variety is introduced this year for all men, women and kids clothing. Warda is a renowned name in the clothing industry of Pakistan. 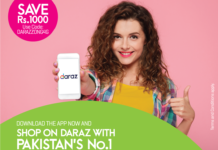 This summer Warda decided to give surprise discount on the clothing collection 2018 just by entering in the community of Warda.